There are so many incredible things to do in Playa del Carmen that it can be hard to sort through the options. Well, I’m here to help. After three months living here, I’ve had plenty of time to try out many of the awesome activities in Playa del Carmen: and I’ve come up with this list of the 21 absolute best things to do in Playa del Carmen in order to help you make the most of your trip to this beautiful town on Mexico’s Mayan Riviera. 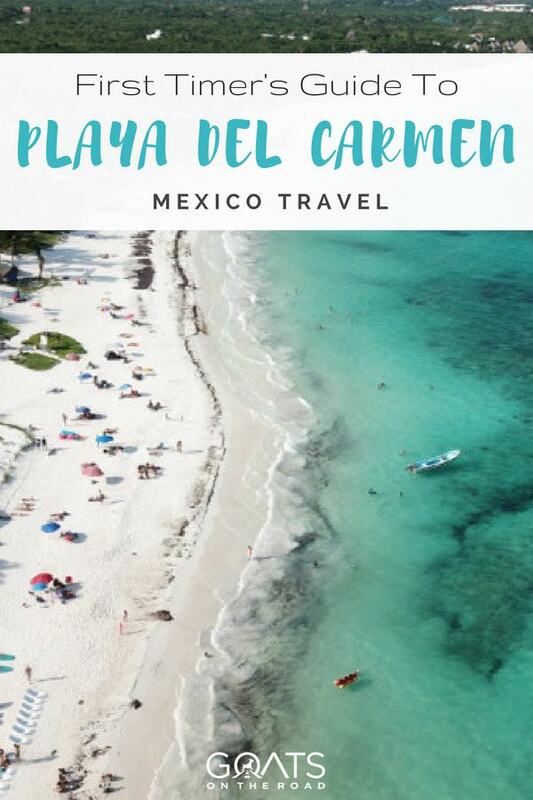 From the secret beach spots, to where to find unique local dishes, to the best day trips, I’ve got you covered with an exciting array of things to see in Playa del Carmen. This is one of the best places to visit in Mexico for sure. Believe it or not, the best places to swim in Playa del Carmen aren’t in the ocean. Ask any local where to take a dip and you’re certain to get the same answer: visit a cenote. Well, I’m glad you asked. Cenotes are essentially underground swimming holes formed where limestone bedrock gives way to underground rivers and springs. There are thousands of them in the Yucatan peninsula and visiting one should be at the top of any list of things to do in Playa del Carmen. There are many cenotes to choose from, but my personal favourite is Cenote Azul. You can visit on your own by taking the “collectivos” that leave for Tulum on Calle 2, you can rent a car to get there (just be sure you have travel insurance covering Mexico), or you can join up as part of a tour. Oh, and if you’re certified, you can even go diving in many of the cenotes! Named one of the New Seven Wonders of the World, the Mayan ruins at Chichen Itza are a spectacular site to behold. One of the most important archaeological sites in all of Mexico, Chichen Itza is located deep in the jungle, and a bit of a challenge to reach. You can rent a car and make the two-hour drive yourself, or check out any of the many tours from Playa del Carmen to Chichen Itza. Pro tip: if you can, get up early and visit the temples before the crowds and the heat set in. 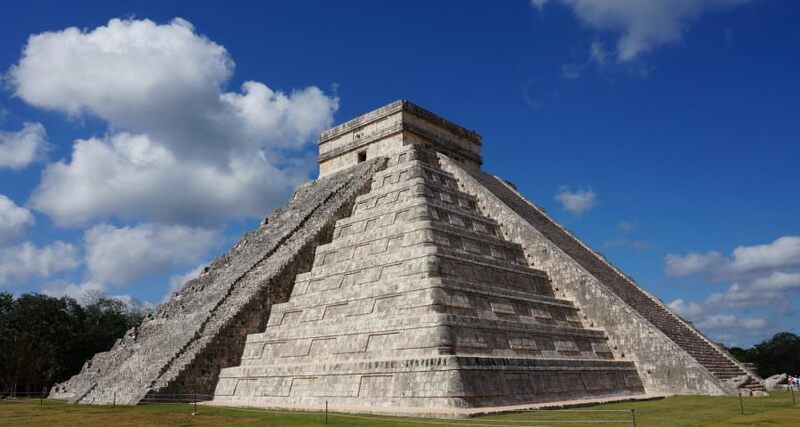 Click here to learn more about the Chichen Itza tour from Playa del Carmen. Finding authentic local cuisine in Playa del Carmen can be a bit of a challenge, as the tourist zone is filled with imported restaurant chains started by celebrity chefs. 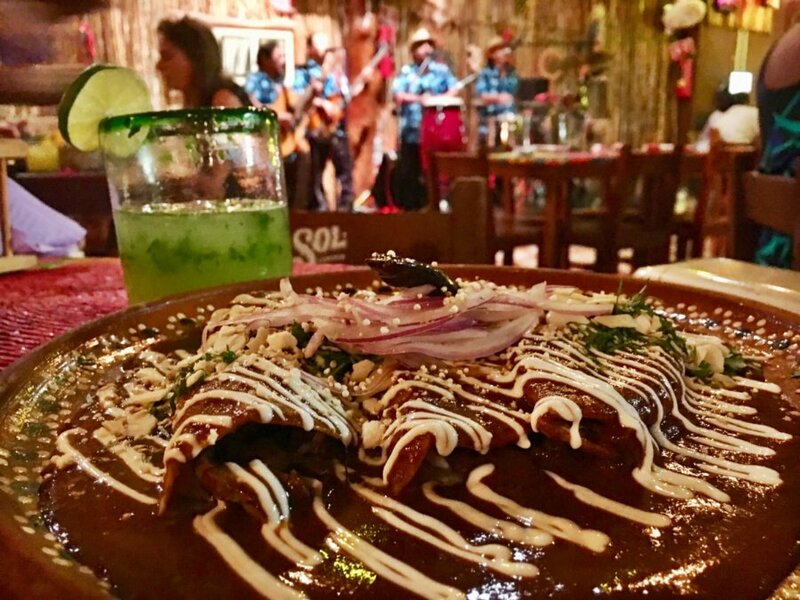 But nestled in the hustle and bustle of La Quinta Avenida (Playa’s main pedestrian drag) is La Perla, a gem of a restaurant that serves up traditional and utterly delicious Mayan food with nightly performances of live music. Try the traditional tlayuda or, if you’re feeling really adventurous, any of the several dishes made with grasshoppers! Eating authentic Mexican food is one of the best things to do in Playa del Carmen, and Mexico as a whole. For a place whose first name literally means “beach,” it can be surprisingly difficult to find a comfortable and affordable stretch of sand. 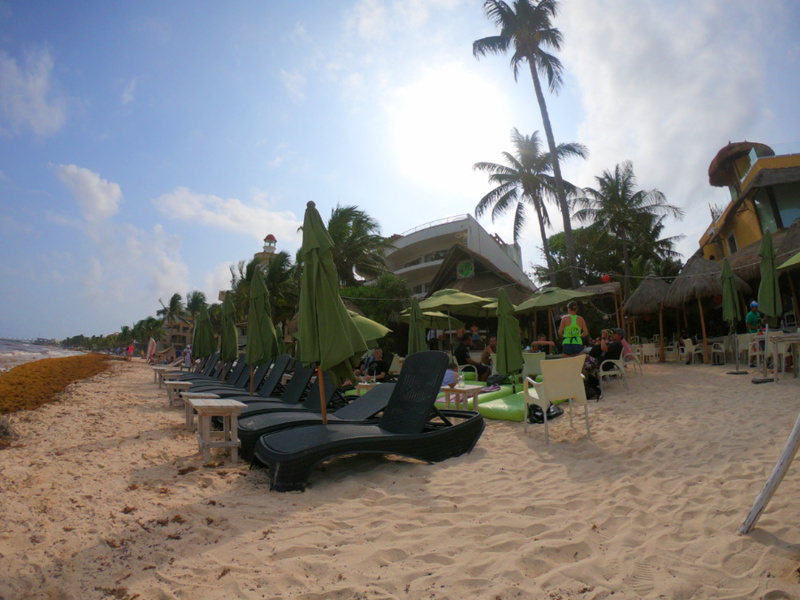 Most of Playa del Carmen’s prime beachfront is consumed by exclusive resorts or beach clubs charging exorbitant prices for the use of a beach chair. Thank goodness, then, for Lido’s beach club, where there’s no fee for using the beach loungers and no minimum spend. Just pay for whatever you order, and enjoy the comfy green loungers or the swings at the laid-back bar. 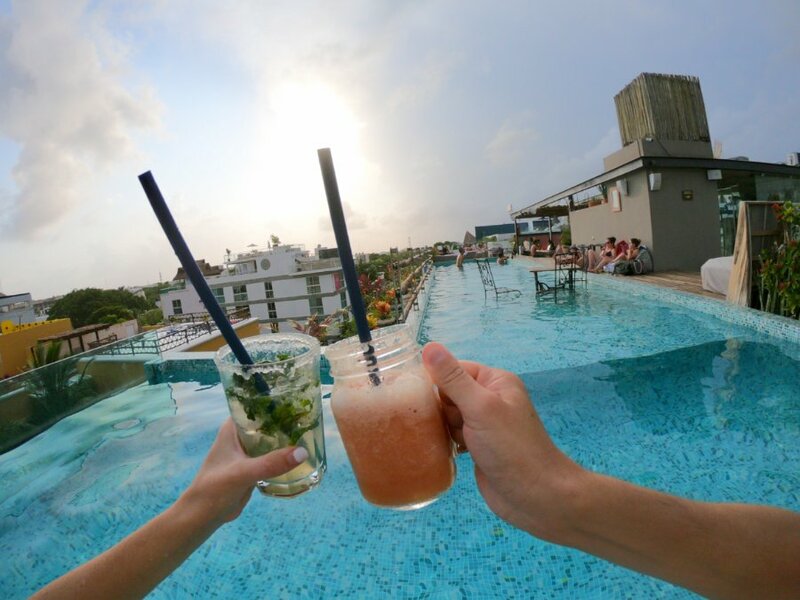 One of the most relaxing things to do in Playa del Carmen is to hang out at one of the city’s many rooftop pools. My favorite of the bunch is the pool that sits atop the stylish Be Playa hotel. You’ll need to spend a minimum of 200 pesos ($9.60) per person to enjoy the pool, but it’s well worth it and that total is still only half the minimum spend at most other rooftop pools in the area. The drinks here are solid and the pool is rarely overcrowded. It’s a great way to beat the heat year-round. 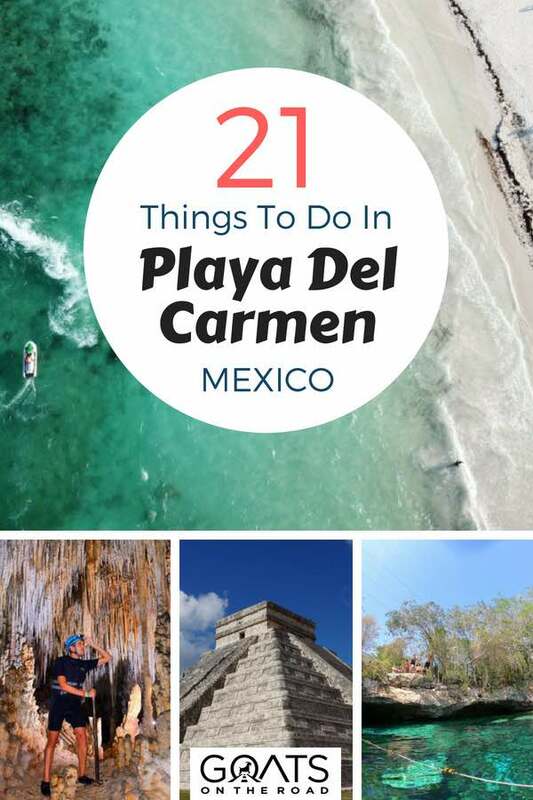 I know what you’re thinking: why in the world would waiting in line be on a list of the best things to do in Playa del Carmen? Well, try the food at El Fogon first and then we’ll see if you’re still asking that question. Easily the most popular restaurant in Playa del Carmen, El Fogon is a Mexican cantina so busy that its main location on Avenue Constituyentes sports a sizeable line every night starting around 7:30 PM. Don’t worry though, the line moves fast, and the wait is well worth it (just ask the many locals who frequent the joint). There are many incredible beaches just a short ride away from Playa del Carmen, but my favorite is the secluded beach at Xpu Ha. You’ll need to either rent a car or take a collectivo minibus to get there, but the journey will reward you with access to a pristine white sand beach with clear water and without the crowds. There is a 50 pesos ($2.40) entrance fee to the beach. You can get that back if you meet the minimum spend at one of the handful of beach clubs, or you can just bring your own towel and settle in on any of the many wide open stretches of sand. Right off one of the busiest and most chaotic streets in Playa del Carmen is the understated entrance to the Alux restaurant. You’ll feel like you’ve left the city behind as you descend into the spectacular underground cavern (complete with its own mini-cenote) that plays host to the restaurant. If you’re looking to splash out, Alux also offers some of the best fine dining in town with main courses starting at 350 pesos ($16.75). 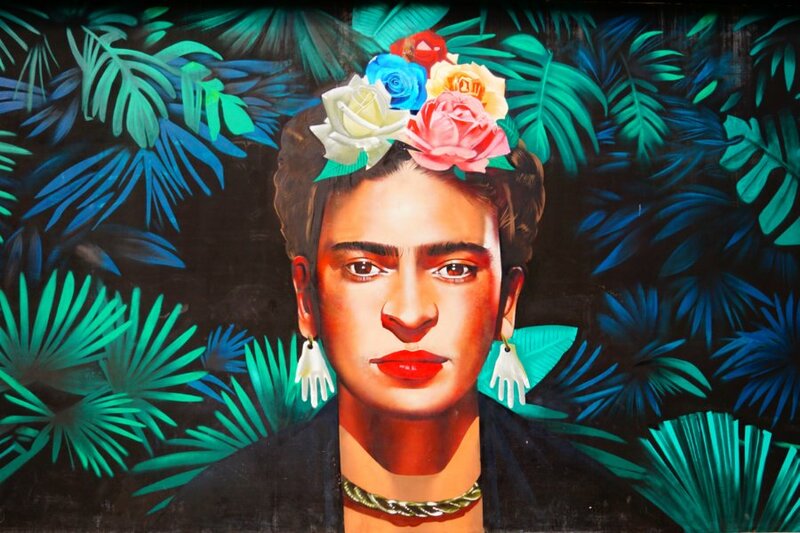 One of the most popular things to do in Playa del Carmen is to visit the stylish Frida Kahlo Museum. Conveniently located on La Quinta, the museum is open everyday from 9 am to 11 pm and the entrance fee for the general public is around $15 USD. Inside you’ll find a series of exhibits dedicated to the life and history of Mexico’s famous portrait artist (note that, unfortunately, there usually aren’t original works on display). Elote is a local street food dish that is essentially grilled corn covered in a sort of mayonnaise and cayenne pepper paste. Ok, I realize that doesn’t sound super appetizing but trust me… it is. You can find elote at street vendor stalls around town for juts a dollar or so: the best bet for finding it is on Avenida Juarez around the intersection with Calle 15. One of the most fun things to do in Playa del Carmen at night is to get your groove on. And there’s no better place to do that than Zenzi, an upbeat but not-too crowded joint with live music and a vibrant dance floor. Thursdays and Saturdays are usually salsa nights, but check the schedule on to be sure. Have two left feet? That’s fine, you’ll still love the fun ambiance, affordable prices, and the incredible beachside location. Have you ever been swimming inside a cave before? Well, if not, you definitely need to check out this unique thing to do in Playa del Carmen. Located just a few minutes outside the city, Rio Secreto is a complex of five stunning caves that are filled with underground rivers and springs. You’ll don a wetsuit and join a small guided tour through a cave that includes the incredible experience of swimming inside a pitch black cave. It’s definitely one of the awesome things to do in Playa del Carmen. GoatsOnTheRoad visited Rio Secreto a few years ago and we still think about how incredible the experience was! The cave truly is stunning and swimming through it is something we’ll never forget. 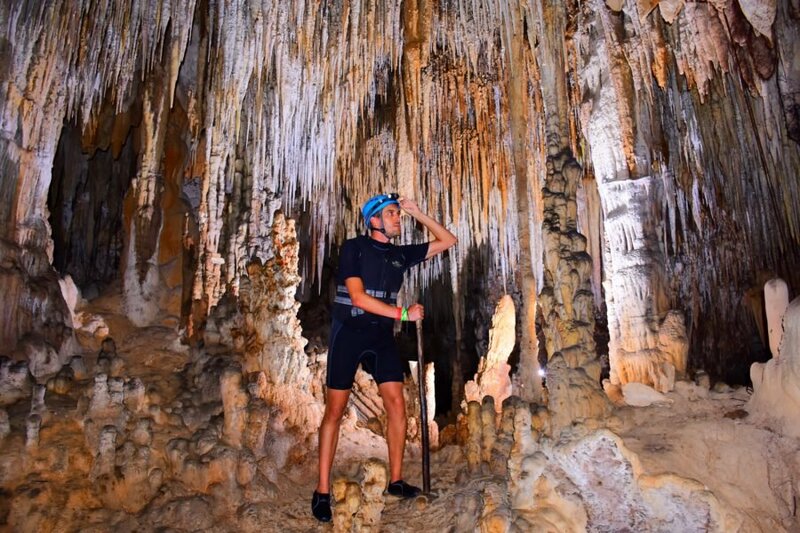 This is definitely one of the things to do in Playa del Carmen that you won’t want to miss. Click here to book your entrance tickets including transportation, and click here for just the entrance ticket. At at least $50 per hour, it’s not a cheap activity in Playa del Carmen, but renting a jet ski is definitely an exciting way to enjoy the water in and around Playa del Carmen. You can find vendors renting jet skis along La Quinta Avenida, or book a package tour including jet skis in advance. The main artery of Playa del Carmen is La Quinta (5th Street), is a vibrant pedestrian street running well over a kilometer parallel to the beach. La Quinta is lined with hundreds of shops and vendors offering everything from designer handbags and questionable pharmaceuticals, to funky trinkets and unique artwork. Sure, it’s more than a little touristy, but a visit to La Quinta should be on every list of things to do in Playa del Carmen. The Caribbean water in Playa del Carmen is blissfully still, especially right before sunset, which makes it a great place to try out paddleboarding. Paddleboarding rentals or lessons can be arranged through Aloha Paddle Club, starting at around $45 USD. The location is at the Fusion beach bar, which also makes a great stop for a drink or three after you’ve come back off the water from this awesome activity in Playa del Carmen. Ok, so it may be a little cliché, but there’s no denying that Coco Bongo is the mainstay of Playa del Carmen’s throbbing nightlife scene. At over $80 U.S. dollars for a ticket, a night at Coco Bongo doesn’t come cheap. But your admission includes drinks, a spectacular show featuring rotating acts (this past May saw a Star Wars-themed show), and a night you won’t easily forget (or maybe you will….). 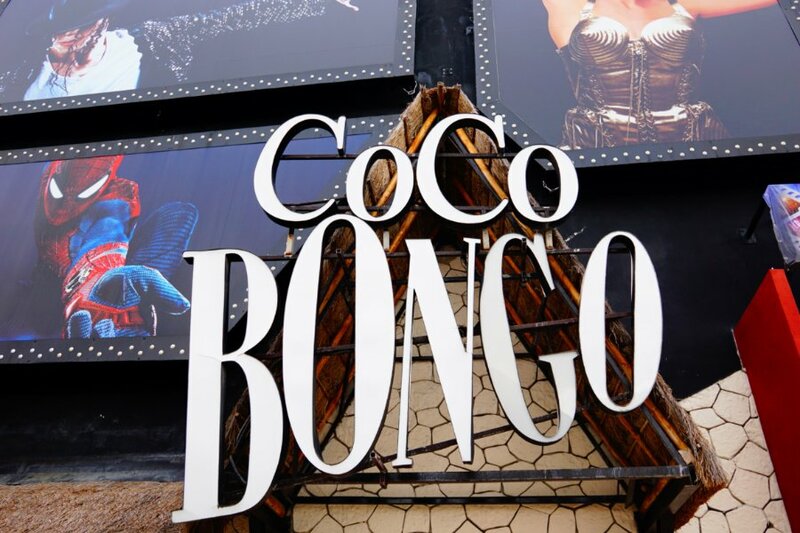 Partying at Coco Bongo is one of the most popular things to do in Cancun as well. A marquesita is a local dessert that sort of resembles a crunchy hand-held crepe. The traditional version is served with Nutella and Edam cheese, which makes for quite the unique flavour combination, though you can also get them with peanut butter, cream cheese, chocolate syrup, or a variety of other toppings. Marquesita are served up by mobile street food vendors, so you may need to keep your eyes open to find one. The best places to look for them are on Calle 2 and Avenida Juarez around their intersections with Avenida 20. Playa del Carmen’s main beaches get crowded quickly, so do like the locals do and head north to the much quieter, much less commercial beaches at Punta Esmerelda. It’s one of my personal favorite places in Playa del Carmen. 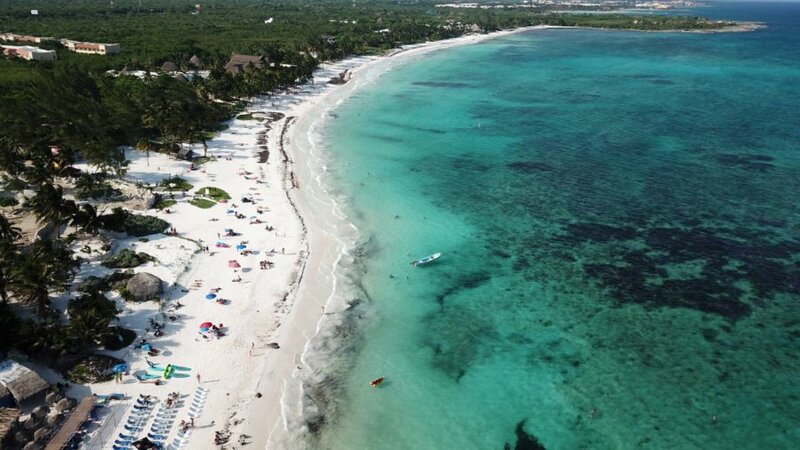 You won’t find huge beach clubs here, but you will find a small cenote and some of the best beaches in Playa del Carmen. You can get to Punta Esmerelda by taking a short taxi ride from town, or by walking north along the beach for 45-60 minutes from central Playa. Playa del Carmen doesn’t have many traditional points of interest (the city is largely built around tourism), but one the more interesting places in Playa del Carmen that you can find is in Parque Fundadores. There, you’ll find the Portal Maya Statue, a gorgeous sculpture depicting two figures rising up to touch each other. You’ll also street vendors selling snacks and wares, as well as the occasional public performance by dancers. 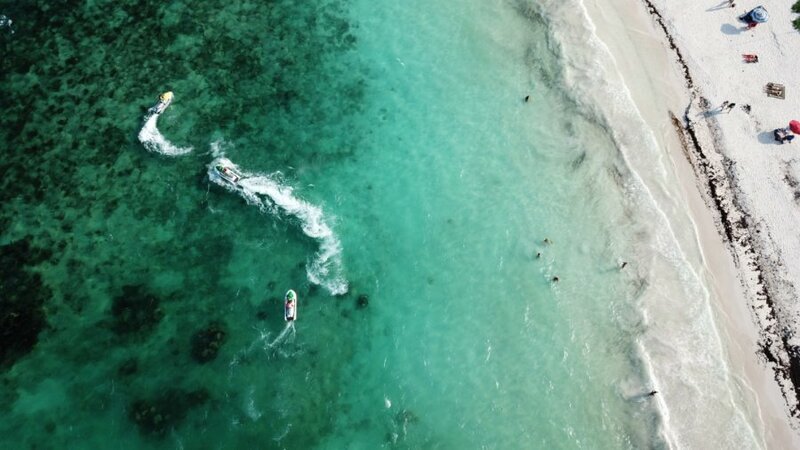 Just a short ride south of Playa del Carmen lies the quiet beach outpost of Akumal, one of the best places on the planet to go swimming with sea turtles. 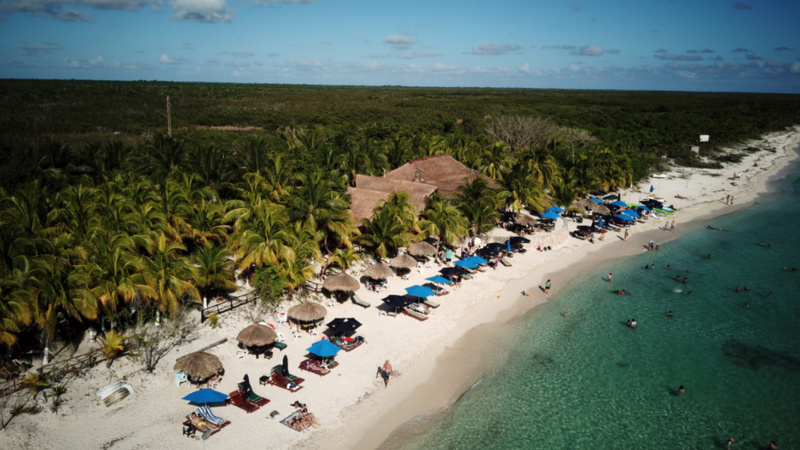 You can access Akumal as part of the many guided tours that offer snorkeling here, or you can take a collectivo south from Playa del Carmen, walk to the beach, and rent your own gear. You don’t even need a boat to swim with the turtles – you can usually find several just a short distance off the shore. Hop on a ferry from Playa del Carmen’s main dock and in 45 minutes, and 135 pesos later, you’ll find yourself whisked away to the island of Cozumel, home to some of the bluest water in this part of Mexico. Once in Cozumel, you can enjoy the world-class diving and snorkelling scene. Or you can rent a car (my favourite: the old VW convertible beetles!) and take a drive around the island, stopping at the many beach clubs that dot the route. Ready for Playa del Carmen? 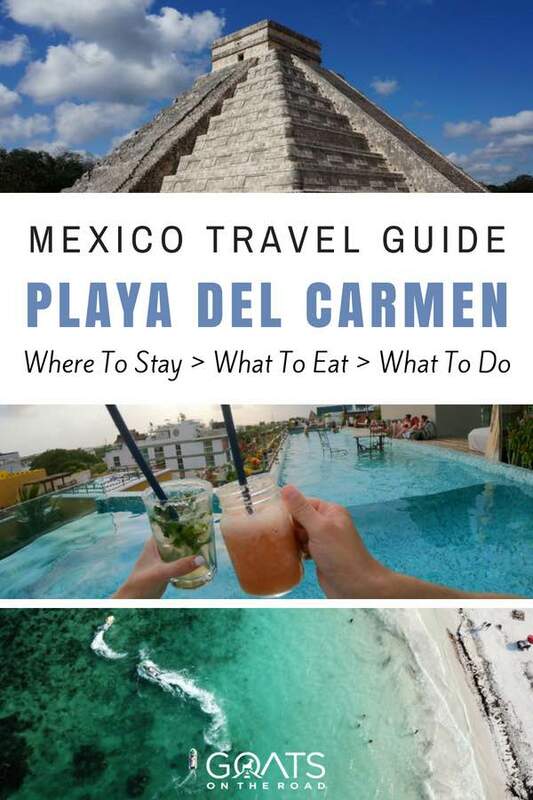 There’s so much to do in Playa del Carmen that you might feel overwhelmed with all these amazing options, but the truth is that you can’t go wrong with any of the items on this list. I’ll leave you with a quick tip to help you save some cash during your stay in Playa del Carmen: while many vendors accept US dollars and the ATM on La Quinta even dispense them, the exchange rate you’ll get is likely to be a huge rip off. 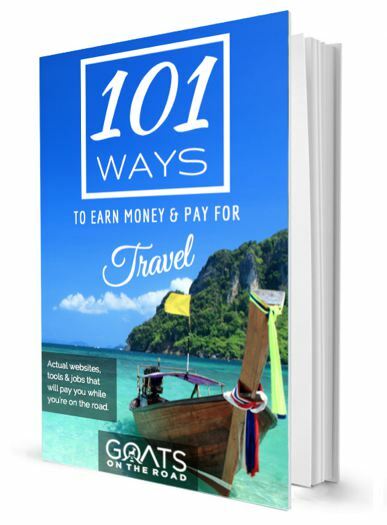 So pay with pesos and use the money you’ll save to do a few more things in Playa del Carmen. There are a lot of adventure activities in this city! Make sure you're protected with a good travel insurance policy. 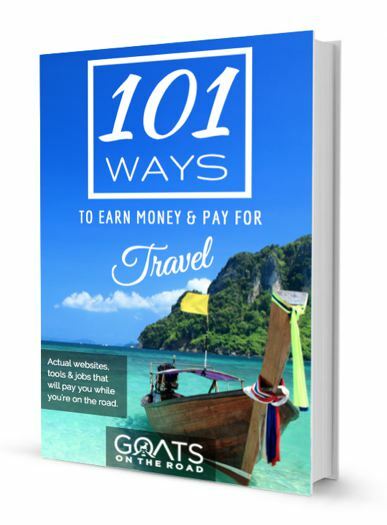 We use and recommend WorldNomads for travel insurance. This is a great place to rent a car! We always book with Expedia because they allow you to cancel for free on most bookings and you're never charged until you actually pick up your ride. There are some really cool tours available here. We always like to check on Get Your Guide because they have so many tours and you can choose the best ones based on the best reviews. For the best deals on short-term hotels, guest houses and hostels, we always use Booking.com. Watch out for last-minute deals! Do your part for the environment while you're travelling! Check out cool eco-friendly travel products on Amazon like metal straws. 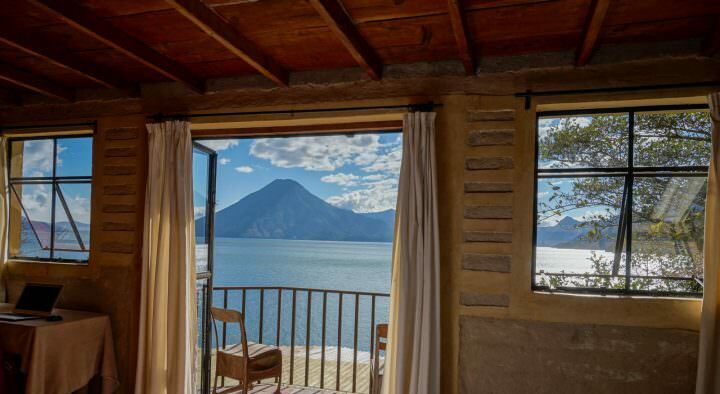 Goats On The Road readers get a $34 discount off their first booking with Airbnb. Click the button below to find out more. Playa Centro – rated “Superb” 9.4/10. Just an 8 minute walk to the beach, 2 minute walk to 5th Avenue, while the bus station is just 1km away. The property features a welcoming owner, air-conditioned rooms and common kitchen area. Double rooms here go for around $25/night in the high season. Click here to learn more and book this accommodation. Casa Seloa – rated “Superb” 9.4/10. This property is located far enough away from the tourist area that you can enjoy peace and quiet, yet it’s just an easy 20 minute walk to the beach, or a quick 5 minute bus ride. Rooms are bright and spacious, and the property offers BBQ facilities and a garden area for relaxing in. Double rooms go for around $30. Click here to learn more and book this casa. Embarkadero Maya B&B – rated “Superb” 9.4/10. There are a wide variety of rooms here at the perfectly located B&B. Rooms are bright, colourful and in traditional Mexican style. The water is just a 5 minute walk away, while some of the rooms enjoy fantastic views of the sea. The owners are very friendly and there’s an excellent breakfast included. Double rooms start at $52 in the high season. Click here to learn more and book this B&B. Newport House Playa Boutique Hotel – rated “Exceptional” 9.6/10. This is a top end, chic apartment style accommodation…at affordable pricing. The beach is just a 6 minute walk away, but there’s also a rooftop, outdoor pool. Rooms are equipped with a kitchenette, fridge, microwave and more. Complimentary bikes are available for rent. Don’t miss this boutique! Suites start at around $75. Click here to learn more and book this boutique. CondoHotel Fabiola – rated “Superb” 9.2/10. This beautiful property offers guests an outdoor pool, hot tub and tastefully decorated rooms. Here you’ll be just a 5 minute walk from the beach and a couple of blocks from 5th Avenue. There are a variety of apartments here offering excellent value at around $100 / night. Click here to learn more and to book this suite. 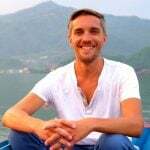 Nate Hake writes the blog Travel Lemming, which focuses on the world’s emerging destinations. 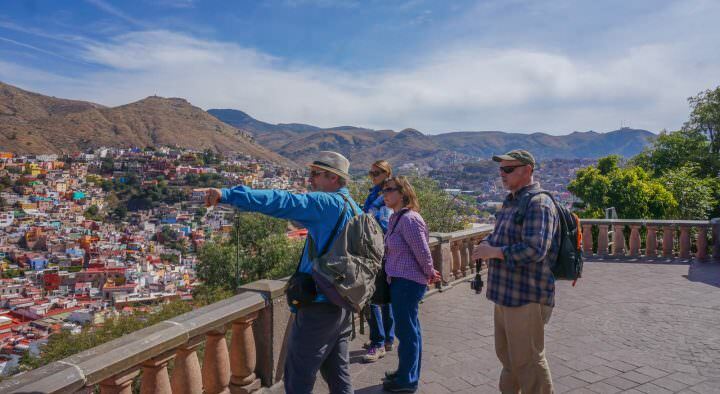 Last year he spent a year visiting 43 countries across six continents, which he followed up by spending six months living in Mexico’s Yucatan peninsula. Seems like a great place to visit. Super helpful tips, especially for a dissipated person like me. I’ve recently switched to a healthier lifestyle and now I’m training with SportMe running app for my first race and also trying to save some money to get back on my feet with finances. Wow so many things to do! Can’t wait to plan my visit. Coco Bongo sounds crazy! Surprised you left out the 3D Museum right in Playa. It is a unique place where a 3D artist has painted images on the floor and walls and one can stand and pose within them. A lot of fun yielding unique photos. Also Xenses, a theme park that has an unbelievable pueblo (town) where it seems you are walking up, but you are really going down. And other tactile things to do. I know they are touristy, but Xel Ha and some of the other natural ecological parks are well worth a visit. Again, surprising that your research did not reveal these great places. We love the cenotes! My Husband and I went on a snorkel tour to Dos Ojos and Casa Cenote and it was fantastic! We got a Gopro camera and captured everything. Although the video is a bit dark and nothing compares to the feeling of being there, it still brings back great memories when we watch it. I would like to thank Chucho from Koox diving for arranging the whole trip to both cenotes. 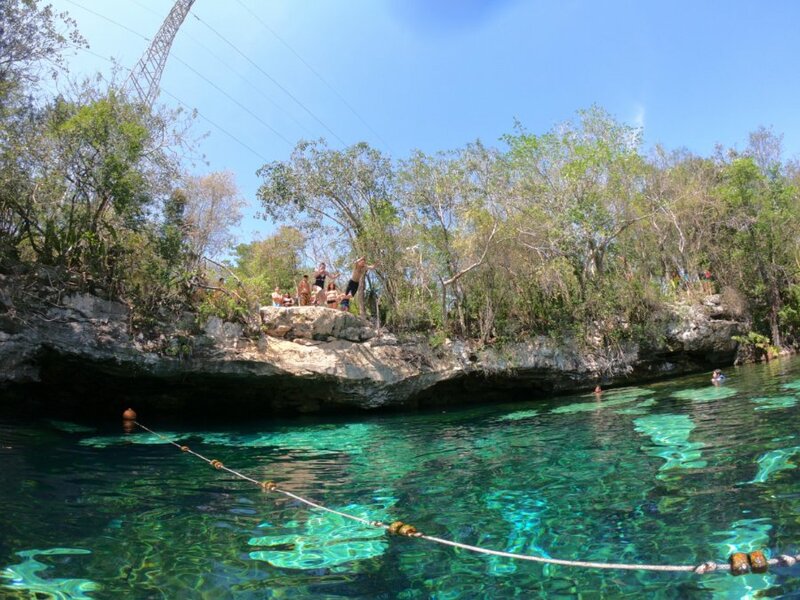 Nate, we will definitely go swim in Cenote Azul as per your recommendation, the next time we visit Playa del Carmen. Thank you for bringing back some great memories. I am going to tell Christian to begin planning our vacation. Greetings Taylor. I am happy that you had a great time at the cenotes with us. Come again next year and I will make you a special discount for diving and snorkelling. Looking forward to seeing you again.